Anyone who tells you that it is easy to paint your own car has never painted their own car. 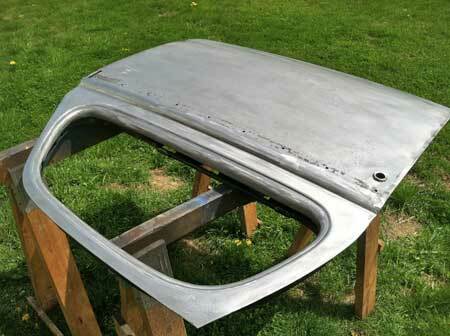 When I ended my last journal entry on my 1937 Buick Special I highlighted the fact that I built a rough paint booth with adequate exhaust fans and lighting and teased you with a picture of the early process of stripping paint from my doors. In the last month I've stripped more paint, sanded, filled imperfections, sanded, primed, sanded and sanded some more. Did I mention that I spent some time sanding?? After finishing the doors (in primer) my wife sort of chuckled and said "You spent all of that time and all you have finished are the doors?" Thanks honey, thanks a lot. So faithful reader, I will give you the details of my efforts. It started out with a basic chemical strip on the outside of the doors. I worked in sections and applied the chemical stripper with a paint brush. After 15 minutes I used a putty knife to remove the stripper. My car had been repainted one time and the first application of stripper removed all of the newest paint. 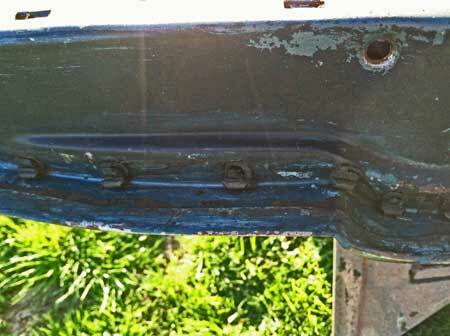 A second 15 minute application removed the original paint and primer revealing bare metal. As I gently scraped of the gooey sludge I held my breath and hoped there would be no body filler or major dents. On the doors I was lucky and found nothing but shiny, mostly smooth metal. With the paint mostly removed I neutralized and washed any remaining stripper off with soap and water. There isn't anything challenging about chemical paint stripper but it takes time. Also, wear gloves, safety glasses and long sleeves while using this stuff because it burns. One might think that paint stripper is acidic but it is actually a base with sodium hydroxide as its active ingredient. I forgot to remove these clips when I disassembled the door so I had the pleasure of removing all of them before stripping paint. This was the first day of paint stripping. 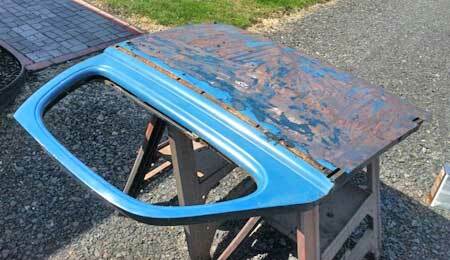 The rust color on the main panel isn't rust; Fisher Body used maroon primer. When the doors were dry I did my best to remove any rust that could be reached on the inside of the doors. Access to these areas was difficult but I did the best I could and then applied Eastwood's Rust Encapsulation system to any areas of concern. This system requires an application of a product called Rust Converter followed by a 48-hour cure time. After the converter cures you can brush or spray on the actual rust encapsulator paint. The description of the system makes you think it can be applied over some pretty deep rust but fortunately my areas of concern were simply surface rust spots and areas where I wanted to reinforce for the future. With the inside of my doors prepared I pulled out my 1/4-inch angle grinder and installed a 3M Roloc Bristle Disc. 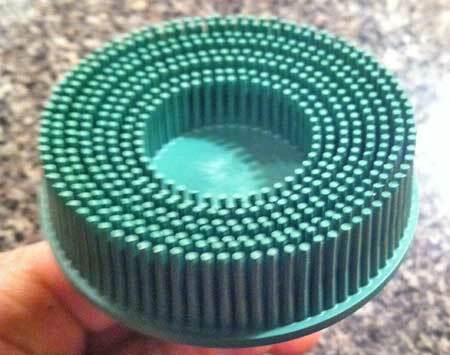 These bristle discs are great little sanding pads with plastic fingers that produce a surface finish equivalent to 60-grit sandpaper. I used the bristle disk over the entire surface of the doors but focused on areas where stubborn paint remained and the strip under the door trim which had some very minor pitting. My angle grinder is pneumatic and gave my compressor a good workout. In fact, it wasn't long before I realized I would need to install a filter to catch water as the compressor was producing a small amount of condensation and feeding it through the line. After the 60-grit finish I pulled out my dual action sander (also pneumatic) and sanded the doors with 180-grit sandpaper. When I completed this step I washed the doors with mineral spirits and finally Eastwood's PRE Painting Prep solution and proceeded to spread body filler in the small pits under the door trim and any areas where there were scratches. The body filler that I used was 3M's Platinum Plus filler recommended by a friend who runs his own restoration shop. Platinum Plus filler can be sanded in 20 minutes but I have a family and a full-time job so I set the doors aside for a while. After a day or two I broke out the DA sander and came back and re-sanded the doors and filler with 180-grit paper and finally finished the initial sanding process with 320-grit. So that was a lot of work just to get to the fun part of spraying primer, wasn't it? Getting to this point took around 11 hours of labor. That doesn't include the time waiting for chemicals to react, water to dry, paint to cure, etc. That is just the time I spent actually touching the doors. It quickly became quite apparent why people pay BIG dollars for a professional paint job. Fear not, I was/am still motivated to tackle the job on my own! The paint I intend to spray on my car will be acrylic urethane. With this in mind I elected to use an etch primer followed by a 2K primer. The etch prime that I use is 5 Star Etch Primer. It requires a 1:1 mix with reducer and a gallon of each will cost around $100 total. 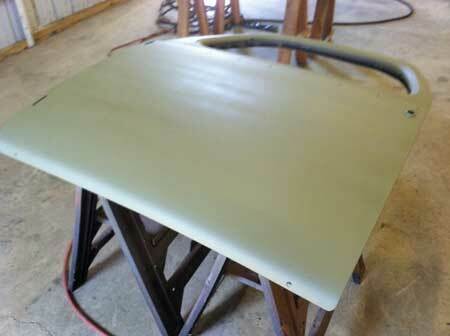 It is easy to spray and it can be top-coated without sanding as long as the next layer is sprayed within 24 hours. After two coats of etch prime I then came back and spayed two coats of Marhyde Ultimate 2K primer. 2K primer is a high-build primer meaning it will fill small scratches and imperfections. Naturally this filling property has limits so it won't take the place of filler, dent repair or proper body work. Driver's door after etch priming. After waiting a few days for my primer to cure I grabbed a Durablock sanding block set and some 180-grit sandpaper and proceeded to sand down most of my 2K primer. It is important to use sanding blocks because the blocks remain rigid and reveal low spots. If you just used your fingers and no block your fingers would travel in to the low areas and also apply uneven pressure. This would then be visible after topcoat. After block sanding I applied two more coats of 2K primer. Door after 180-grit sanding. Note that the area under the door trim needs a bit more attention. For now, the doors have been placed aside and I will focus on other areas of the car. Before I am ready to spray my color top coat I will spray the doors with a light coating of guide coat and then sand again with finer grits until the surface is baby-bottom smooth. The guide coat is used as another indicator to show how straight metal is. It will come out as tan spray and it will be difficult to sand off in low areas. This will tell me if more fill primer is needed. Before spraying my top coat I will wait until all of my parts and pieces have been primed. 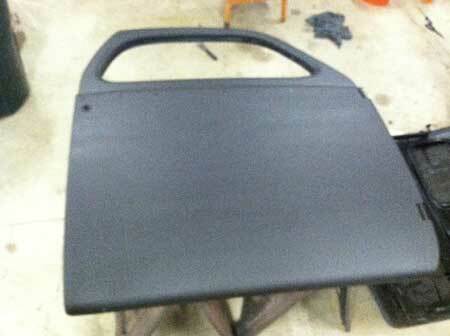 Driver's side door in final primer. 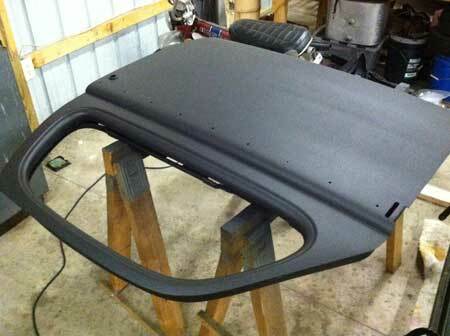 Passenger side door in final primer. The next area for me to tackle is my car's body. It is literally just a shell on the frame at this point as we've removed all of the glass and even the trunk lid in the past few months. I will use the same paint removal process (chemical stripper followed by progressive sanding) and priming process. 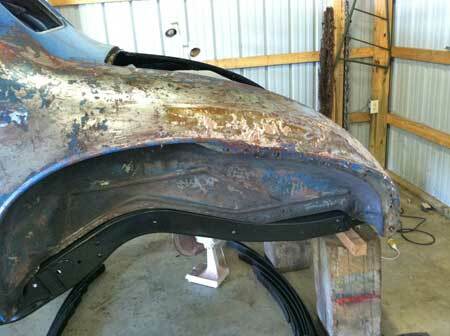 One area on the body that I've already tackled was the wheel well area on the body. As I've groaned about it in other journal entries I will mention it one more time — the undercoating on my car is a royal pain to remove. It is essentially tacky tar that absorbs dirt like a sponge. The very nature of the wheel well makes that area a dust magnet so you can imagine the mess in my wheel wells. To remove all of this I first scraped off as much dirt and debris that I could using a putty knife. After that I used fire from a Bernzomatic torch. The fire approach was obviously quite effective and here I worked in opposing sections so I wouldn't overheat and possibly warp the sheet metal. After the flame was removed and the metal cooled down to room temperature I removed the remaining residue off with wash thinner. This area is now ready for progressive sanding. 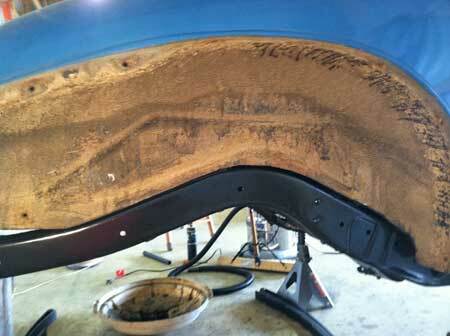 Driver's rear wheel well after scraping, burning and washing the undercoating off. 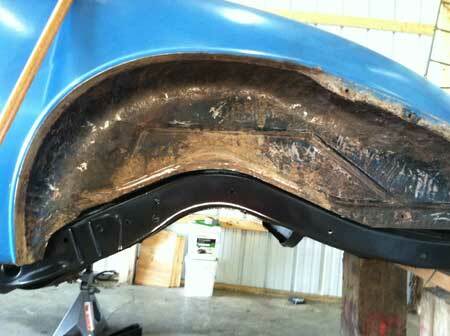 Passenger side rear wheel well before removing the undercoating and dirt. 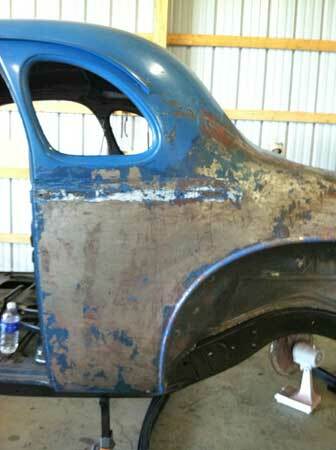 A good shot of the cleaned-up wheel well and the beginning of paint removal on the body. Note that white stuff on the body — it is body filler. More on that in my next journal entry! Another shot of the body during paint removal. Some body filler is discovered under the body trim strip, a popular area for water retention. In between all of this scraping, sanding and priming I have had the chance to have a little bit of fun driving old cars. My son turned two in May and at his birthday party I gave rides up and down the grass runway that joins our property in a Ford Model A. At one point there were 7 kids in the car screaming and shrieking and having a good time. For all but one of the kids it was their first experience in an antique car. It was a very rewarding experience for me to share the old car hobby with the future of the hobby. 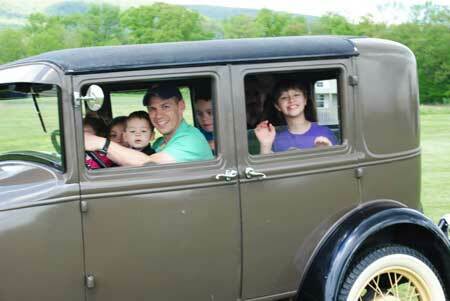 Giving several kids their first taste of antique cars in mid-May. While he is already hooked in the old car hobby we gave my son a repainted Garton pedal car from the mid 1950s. We picked the car up at a swap meet last fall and I repainted it in early spring. Aside from the same etch prime and 2K primer that I mentioned above the car received absolutely no body work and the top coat is spray can Rustoleum. Pierce helped me paint the numbers on the hood and a couple of arrows on the back to honor his namesake but it is a pedal car that will be crashed, bashed and destroyed again and again before he outgrows it. By that time we will likely need a father-son project; I hope the Buick is finished by then! 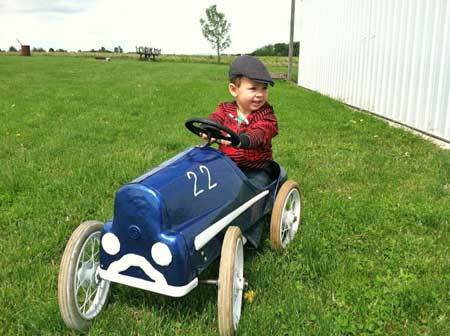 Young Pierce is a very lucky boy to have a 1950s pedal car that he is allowed to have fun in!